Look at the screenshot. NSWorkspace now identifies the Desktop as a special folder and associates it with an icon. The icon is new too. Also the Music folder is now recognized as a special folder and has its cool new icon too. With this last additions, the addition of special folders to NSWorkspace is quite complete. 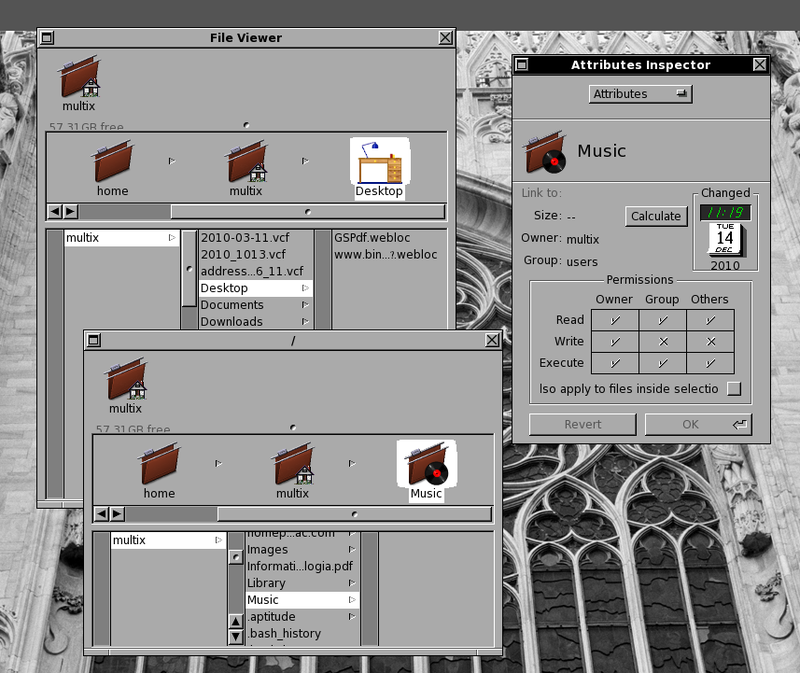 Images, Documents, Downloads, Music and Desktop are recognized as special folders in the user home. 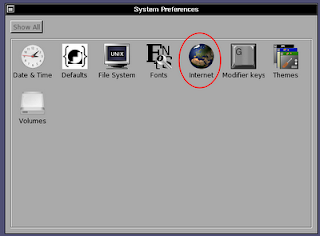 The user home itself had already a special icon since a long time. Regarding system-wide folders, the "System" and the "Library" folder have its icons, if they applicable for the used file system layout. These icons are all theme-able too, each Theme can customize them. ProjectCenter, GNUstep's IDE, equivalent of ProjectBuilder / XCode was released in version 0.6.0. 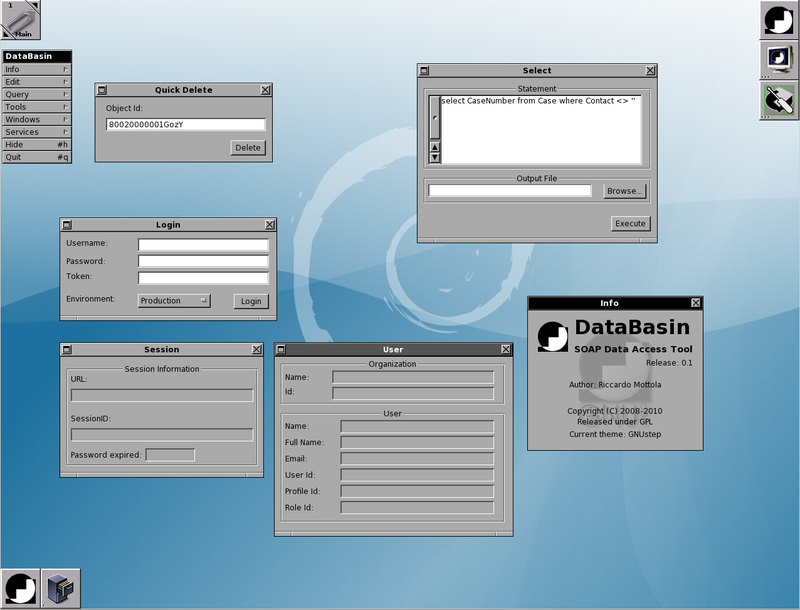 DataBasin v 0.2 was released, the free software, open source tool for working with Salesforce.com. The core library was enhanced and new features were added. Read more and download it from the DataBasin homepage. NSWorkspace handles now a new set of icons reserved for special folders, similar to what Apples Finder always did or what Windows does. 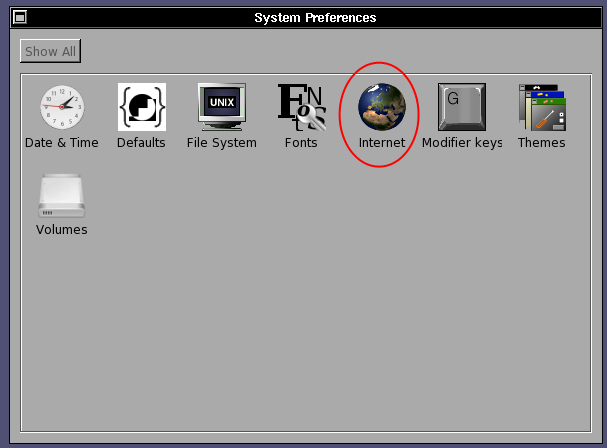 Up to now the root icon and the user home were special. I designed and added a new cache-based handling to NSWorkspace for the icons depicting the user's Documents, Images and Downloads. For the the System folder a new icon is associated where applicable, since it doesn't make sense in certain Layout. The Library icon will associated with the Library folder in all Domains (System, Network, Local). GWorkspace has been adapted to display these icons and it is the primary goal. Check the screenshot and spot them! However since the Icons and the Code are supplied by GNUstep core they will be available for alternative Workspace and File Managers or for any application which asks the Workspace for the icons to display. If you want to try them out, you need the SVN trunk version of GWorkspace, gui and base. The latter is needed because NSPathUtilities needed some tweaking. The icons are for the default theme currently. I plan to update other themes soon. Finally PRICE got proper Bilinear filtering. This was surely long due! The previous linear h+v filter was little more than a quick hack. Bilinear filtering is quick, good and quite sharp and works well with scaling between the 50% and the 150% range. It is quite good when downscaling while upscaling beyond a certain range surely has better algorithms. LaternaMagica and its export tool with automatic constraining will benefit from this new filter too. I created a new System Preference Module called Internet. It is intended to hold system-wide configurations for Internet applications, a bit like Macintosh had up to version 10.2 (or, for that matter, even the older System 7.5 up to 9... or SGI Irix IndigoMagic...). 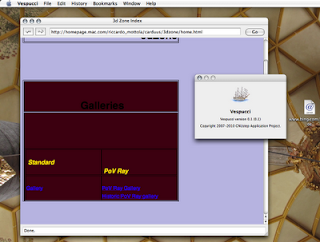 Currently, the preference implemented is the default browser selection (used by NSWorkspace when it has to open URLs). The registered browsers are presented, they are set immediately on selection and the corresponding application icon is conveniently displayed. Currently the selection of browsers is essentially limited to Vespucci and SWK's test-bed SWK Browser. Browser wrappers are not supported because they are unable to register with NSWorkspace correctly as they can't open URLs. A quick update! Vespucci and SWK are now able to display our GNUstep documentation. 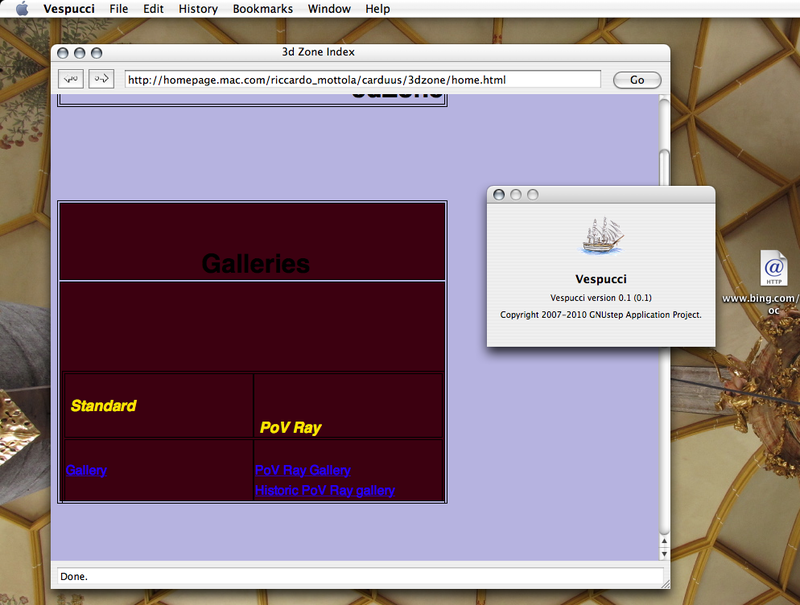 Links and frames do work now much better now. This required an patient debugging in URL management. This is a milestone in the usage of SWK and shows that it can be already very useful as an embedded view. It has been quite some time since the last post here. My coding efforts were and are scattered among the various GAP applications. Vespucci has lately received most of the attention. The window and document controllers were rewritten to follow more the NSDocument and NSDocumentController philosophy. The major benefit is that some smaller features that worked only on Mac now work well also on GNUstep. The recent Document list now works, which is handy for local files. 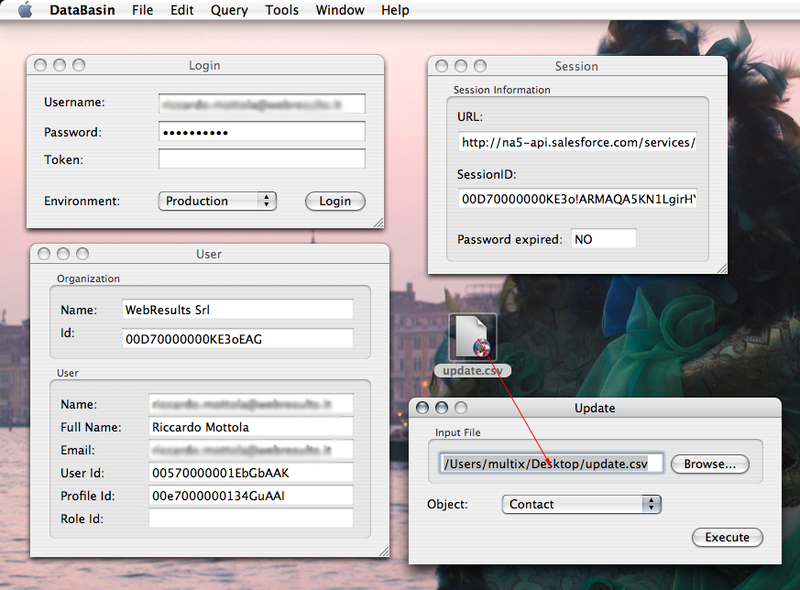 Opening URLs fron NSWorkspace works more reliably. During the restructuring, I added the classic back and forward buttons. Thanks to suggestions of Wolfgang Lux now both the buttons and the menu entries are validating and disable/enable themselves. 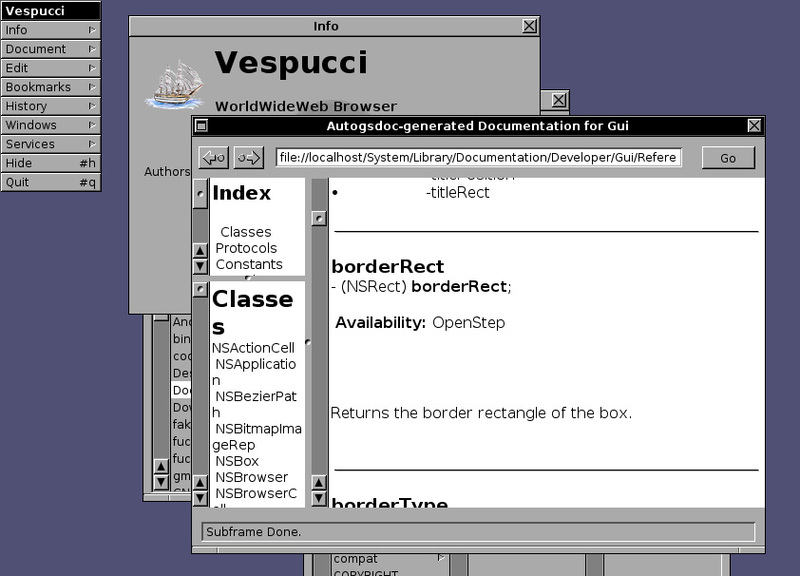 Incidentally, the screenshot of Vespucci running on GNUstep is also on HURD! 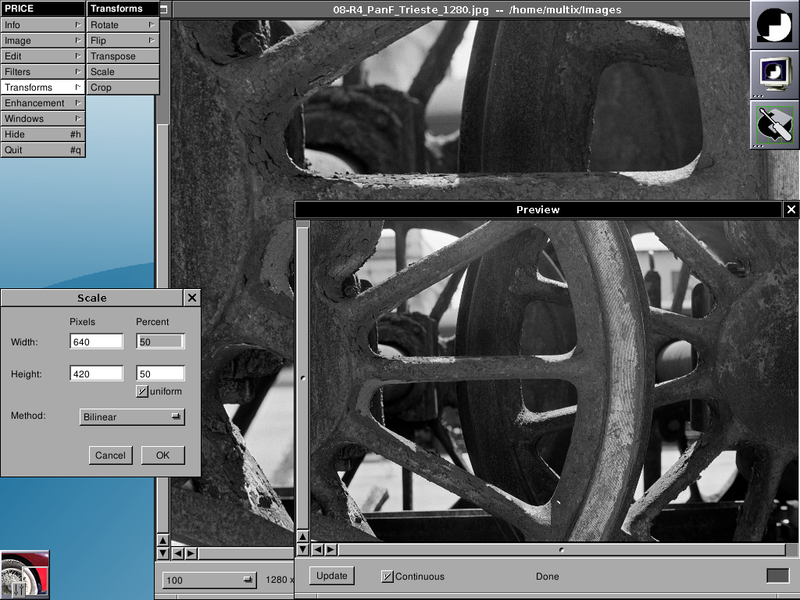 The mac screenshot shows the portability and shows that on Cocoa SWK has rough table support through NSTextTable. The upcoming GSPdf version can be used seamlessly to do Print Preview in GNUstep. The provision to do that has long been in GNUstep's printing code, but no application exploited it. GSPdf is undergoing quite some restructuring and is now a true document-based application. This allows it to register properly for the post script viewing task. Activationg GhostScript's anti-aliasing is supported too (look at the screenshot, where Graphos itself is running without). GSPdf is an interface to ghostscript as gv is, so the displayed quality should remain the same. GWorkspace 0.8.8 is out! Many thanks to all those who helped with testing or contributed with patches. 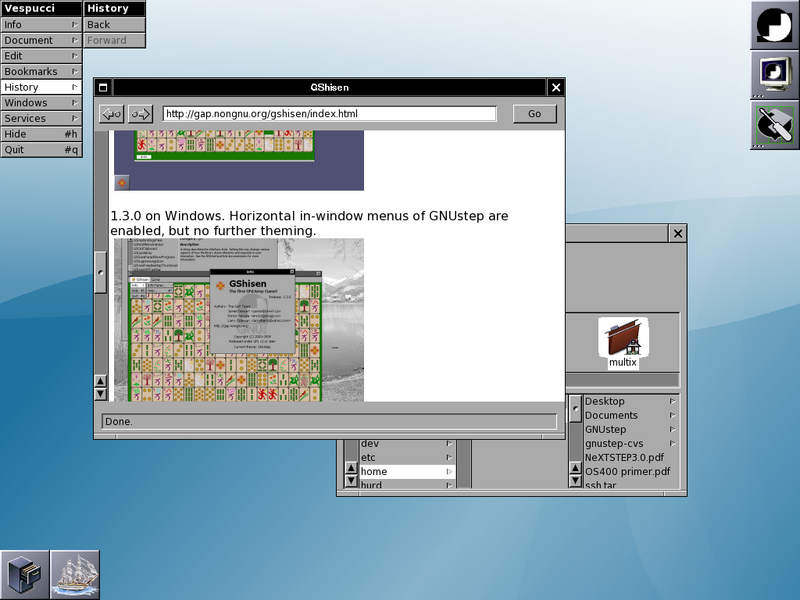 GWorkspace is GNUstep's standard workspace manager. configured, built and installed (up to now it was manual). 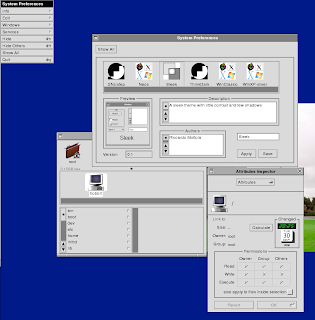 The compulsory screenshot shows GWorkspace running with the Neos theme from GAP. I'm pleased to announce the first release of DataBasin, a tool which allows to access Data on SalesForce.com using its WebService APIs. Core part of the tool is the API implementation in Objective-C, which uses the GNUstep WebServices for the low-level interaction. The API implementation is designed to be reusable in other application and is LGPL'd. 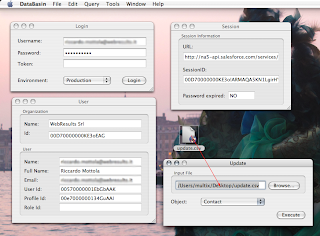 Basic functionalities like Query, Insert and Delete are implemented (and of course log-in!) but the tool contains many rough parts, like the CVS importer/exporter so production use is not yet recommended. As far as I know this is the only open source library for Salesforce.com, at least in Objective-C. 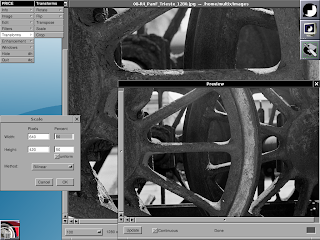 In the screenshot DataBasin running on Debian GNU/Linux. A big thanks to many friends who helped me implementing the API and debugging the SOAP Calls. First of all Richard Frith-MacDonald who extended the GSWS to support SOAP in the first place. Then two colleagues, Andrea Rosa and Enrico Murru who helped track down many bugs. Today is my birthday and I am pleased to finally release Graphos 0.1! 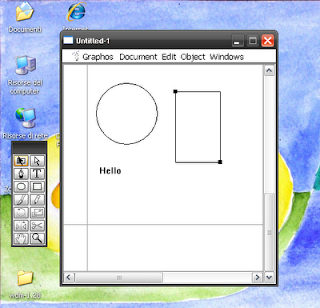 Graphos is a new version of GDraw I was working over the past few years, read past blog entries about it. 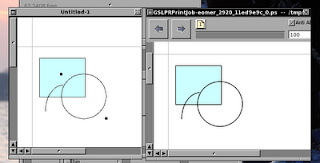 It is a vector drawing application for GNUstep. Graphos is available from the GNUstep Application Project. I made a second attempt in implementing Undo support for ProjectCenter (GNUstep's IDE) I was much more successful thanks to Wolfgang's suggestions. ProjectCenter now supports Undo in the Editor, both if it is docked inside the project window or if it is standalone. A few rough edges remain, but it appears to be functional and usable. Finally! A small feature I was missing since a long time. I released Battery Monitor 0.5 for GNUstep. This version includes some bug fixes and most importantly it supports the ACPI information in the /sys filesystem available on the more recent Linux kernels (as compared to /proc). I noticed that for some ACPI implementation information is written in both places, but for some it is only in /sys so BatteryMonitor wasn't able to find a battery. Currently /proc is still available as a fall-back if no battery is found in /sys, but I plan to deprecate and remove it in the future. Batmon is available as usual in GAP. This version is a maintenance release that guarantees compilation again on the most recent GNUstep release. This release contains code clean-up, fixes of recent and long-standing warnings and some smaller bug fixes. Sources are available at Terminal's page in the GNUstep Application Project. I once created a color scheme for the "Color Schemes" preference module I too created long ago. However, the Color Schemes module was deprecated (it still exists, but it is not installed by default) since we have the new Theme module and the Theme Engine in GNUstep. Themes have all the capabilities of the old Color schemes, plus of course new features. Since I apparently had some faithful users of the old scheme, I took the effort to remake it as a Theme and also tweak some more details. It is already better than the old one. but other details can be tweaked and improved as a theme. However it is almost ready for a 0.1 release! I hope the new theme will enjoy the same popularity that the old scheme had! The appearance of GNUstep gets lighter, it looses much of the 3d accent. Somebody may call it more modern. 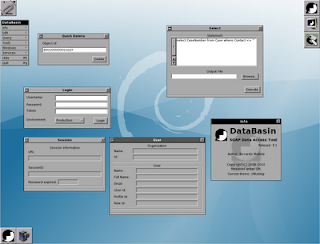 DataBasin, the SOAP data access tool for Salesforce of the GNUstep Application Project, got new features! Check the screenshot. The SOAP layer was enriched with the update call. To perform an update the steps are identical to an Insert and the already existing object describe is use to retrieve the list of available objects. Currently, as with Insert, the CSV column titles need to match exactly the Salesforce fields. Grr now works under Windows! Another proof of GNUstep's versatility. Graphos (GAP Vector editor) got undo support. Add/remove shapes (that worked already) and proper undo of moving, inspecting and editing shapes. This required implementing shallow vs. deep copy of the objects, but the deep copy needs to be smart about which references are indeed duplicated and which not... A bit of fun programming! Laterna Magica v0.2 is out! 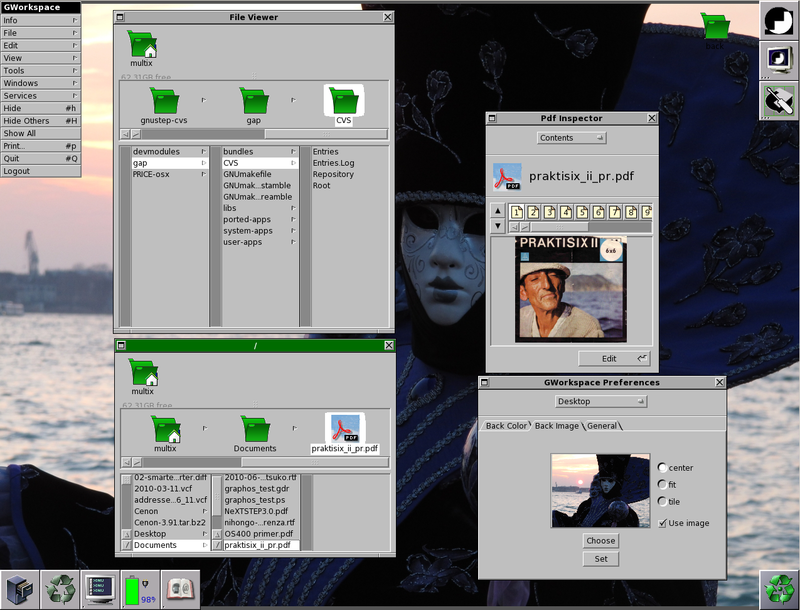 New features are more keyboard short-cuts, JPEG saving and better in-window menus support (NSWindow95Style). The latter feature delayed release another bit of this long-due release, but it works great. 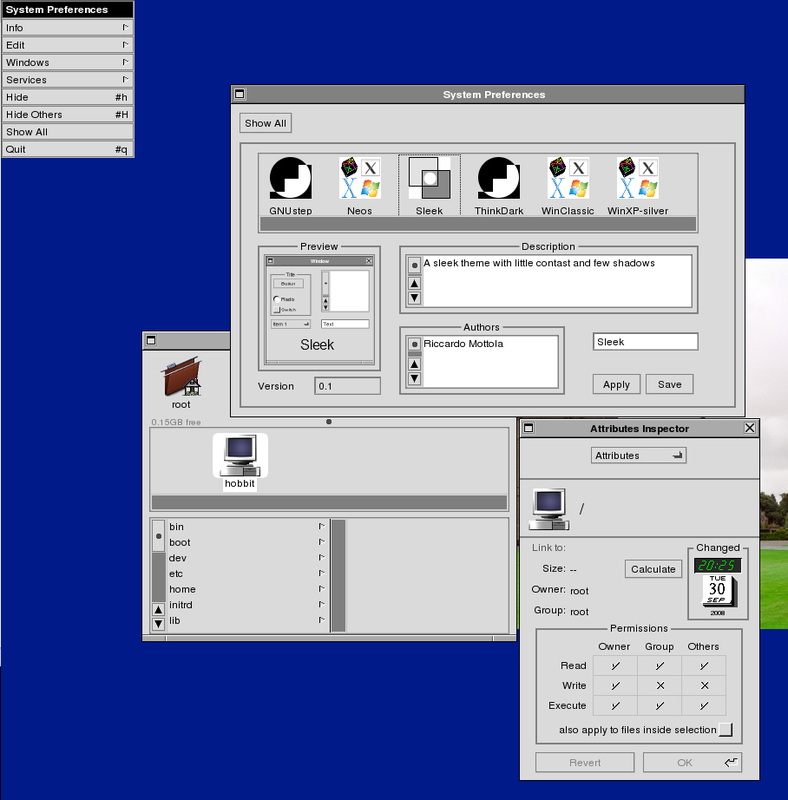 The attached screenshot shows LaternaMagica running on windows using the experimental WinUXTheme which draws several controls native including in-window menus. 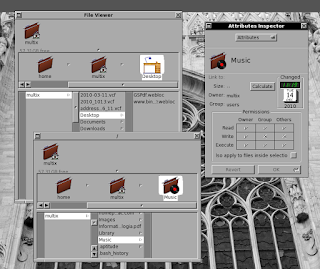 Note how the menu is attached to the main application window but not to the image window. Scrollbars now draw properly on Windows using the native WinUXTheme, sizing and placing is correct. 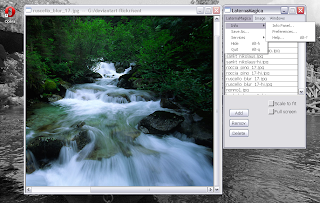 In the screenshot you can see Graphos running with the current version of the native windows theme.